Fernando Casas’ teaching schedule in which his current class on “Plato” follows one on the “Philosophy of Art” at Rice University brought a memory of an art historian in a snit because Casas was “teaching Velazquez,” a subject he obviously thought was out of Casas’ field. Knowing Casas to be a gifted lecturer who fills up a class room, it occurred to me that professional envy caused the territorial outburst. More than Casas’ technical skill and art commercial success, more than his three upcoming simultaneous gallery exhibitions, the thing that inspired my recent studio visit is his reputation as a thinker. Virginia Billeaud Anderson: You have a Ph. D, in philosophy and art collectors that span the globe. The philosopher and artist seem easily reconciled in you. Comment on this. Fernando Casas: Although I am primarily a visual artist, as you said, I studied philosophy and teach it regularly. philosophical ideas have influenced my art to a great extent. I think that a careful examination of the history of art shows that it is, at its very core, a philosophical endeavor, for it is a visual/auditory/etc. articulation of an understanding of who we are, of where we are, of why we are. Hence I do not make that much of a difference between art and philosophy – they are interwoven. VBA: Should philosophy be defined as the search to understand who we are? FC: There is no accepted definition of philosophy. One of the first things one learns in a philosophy class is that an important philosophical question much in dispute is the question what is philosophy? I surely don’t have a ready answer for it. Indeed, philosophy is an attempt to know who we are and where we are, but this is not a definition, and is true also of the sciences. This I don’t think is controversial. More controversial I think is my view that art is, likepPhilosophy and science, an endeavor to understand who we are. I hold the view that the great works of art of human history show us, every time anew, who we are, where we are, etc. For this and other reasons I do not make a sharp separation between philosophy and art. Let me explain. El Greco was a philosopher and you can easily read his Neo-Platonic philosophy in his paintings. You can also read Velazquez’s humanism and Rothko’s existential stance in their works. Do we have any doubt that Bacon’s view of human beings is different from, say, Botticelli? Goya’s view of humanity underwent a radical change: it moved from an optimistic Enlightenment inspired view of humanity to a profoundly pessimistic and dark view. This we can see in his paintings. I can go on and on. VBA: The title of your upcoming show at Gremillion Gallery, The Perfection of Time, announces a primary area of artistic interest, time. The simple fact of three simultaneous gallery presentations exemplifies time, while your installations and related paintings and drawings more complexly bespeak time, some by interacting within and across galleries, so let’s discuss time. FC: Time is a central notion of philosophy and of science and a most difficult concept to approach artistically, since it has no color, no pitch, no taste, no volume and no smell, and yet we experience it. How? It is the most familiar and yet the most obscure reality, as Augustine pointed out. Yet it is at the very center of who we are; at the very center of all reality. I wanted to bring out some of its puzzling reality and how essential it is in weaving the world that we live in. VBA: Jesus Christ, Fernando, it took you five minutes to mention Augustine; if you veer into Aristotle you’ll be talking over my head. FC: Aristotle influenced Augustine on the topic of time as you know. VBA: Guilt-burdened Augustine, who tells us he “learned to love God late,” delayed his salvation so he could fornicate and otherwise gratify his corrupt nature. It makes me sad Augustine considered the scholarly pursuits he loved to be impious interruptions of prayers for forgiveness. FC: Augustine was baffled by the notion of time, for surely our experience of time is problematic, in fact, disturbing. For science, time is static and doesn’t change or move. But we experience time as changing, as a Flow. This is undeniable, yet makes no sense at all! Your reaction to my painting Holding Time - The Rothko Chapel delighted me because you said you saw no differences in the panels, which is precisely the point. Normally we would expect a sequence of images to change slightly like a movie reel, the changes representing the passing of time. But my images are the same. Why? Because I wanted to represent an experience of time closer to reality. How? By challenging your expectations that the images would differ, it helped you to realize there was no difference except that time has passed. The only difference was time and the only thing that changed was time. So you see I confront the viewer with the reality – or unreality – of time, this most perplexing part of all our experiences. I will explain. The development of serialism in the 20th century opened up space for the representation of time, and the possibility of a viewer having an explicit experience of time. Working with series, I intend for the viewer to experience time itself, that ephemeral element present in every perception, which whenever we attempt to grasp it by any means, it becomes again, a “no-thing.” In a sequence of images, like a movie reel, or Monet’s Rouen Cathedral series, spatial arrangements, objects, illumination etc. are the things that change. We don’t see time changing. This is inferred. You can’t logically conclude from my approach that each image represents a different time because of changes in the objects represented, so you realize that the only thing that changed was time itself, and you! That is, the time you took to look at one image, then another, then another. That’s why I have placed mirrors in many of my series. VBA: Tiny mirrors in your installations and wall-mounted pieces make the viewer’s reflection an element in the artwork. FC: I consider the role of those mirrors as the “stitching” of images. In my paintings of sequences of rooms, for example, the viewer sees her reflection in one room then again in the next identical room, the only difference between the two experiences is time has passed. As the viewer moves along those images she is, metaphorically speaking, “stitching” time. VBA: What’s with the ropes? FC: Ropes also “stitch” images of successive “moments of time” and symbolize reality emerging from coordinated interplay of many elements, for no single strand runs the length of the rope but all twisted together create a structure of indefinite extension. They are an imperfect allusion to the linear “flowing” of time. I have more to say about mirrors. During many years of making art, I have created images of other people, i.e. portraits, group portraits, etc. But in this three-gallery exhibit there is not a single image of a person, except for myself. Why is this? Other people do not matter? Exactly the contrary; a viewer finds her image on the mirrors, the reflected images are, as you say, an essential part of the artworks. Now it can be terribly risky to make mirrors part of art because our natural inclination is to fixate on our appearance: How’s my hair? Is my tie crooked? Do I look old? If a viewer focuses only on her appearance, her reflection on the mirror, and ignores the complete work, then my work is dead. My intention is for the viewer to see herself as part of the image that surrounds the mirror, in other words, to see her mirror-image inside the work of art. When this happens, a profound and marvelous example of co-constitution occurs, it occurs because of my contribution and because of the viewer’s “correct” contribution, a new thing emerges and the work of art comes to life. To force correct viewing, and discourage fixation solely on appearance, I use small thin mirrors, sufficient to recognize ourselves, but too thin for a full image, which reflect only pieces of ourselves. So you see Virginia my art illustrates crucial cases of co-constitution, because art exists only when it is experienced. If nobody reads a poem, the poem doesn’t exist; it is just paper and ink. It is the same for the visual arts. Works of art are co-constituted by the artist and the person who experiences them. VBA: It is stated specifically in your artist statement, co-constitution is the “organizing idea” for the three exhibitions. FC: This is a wondrous phenomenon, that by virtue of the simultaneous interplay of various factors, a totally new reality emerges. VBA: I’m feeling remorse over displacing those precious beasts. It’s clear your dogs were banished from indoors for my visit, and find this unacceptable. FC: Gaia! Karma! Stop that! I can’t allow them to come inside, they would want your attention and it would be impossible to talk. And you’re a woman. You know both of those dogs were rescued from dangerous environments before they came to me. Gaia suffered a horrible accident when she was only months old, and was successfully operated on by the Austin Humane Society, but required a prolonged recuperation, and it was a woman, a foster mother, who took care of her during her recuperation. Since she’s been with me I’ve noticed her special affection for women, probably because of her foster mother. VBA: Do they sleep with you? VBA: Your elevated skill reveals academic training. FC: I began young. My parents were lovely. They paid for private lessons, in Bolivia. VBA: Say something about the repeated motif of the missing head. FC: It represents the void in our visual field. The source of our perception is a visual blind spot. Consciousness cannot see itself. After years of mapping the visual world, to find that it is incomplete, was a startling and profound discovery. This is an important element in my art. VBA: To illustrate the visual field must require rigorous observation. FC: Years of observing and recording. My pictorial investigations of the visual field began in 1974 when I made a radical shift away from non-objective art because I decided there was much new to be found in representational art. In 1976 I began to artistically analyze the visual effects of binocular vision which helped me understand that our visual perception of the world comes from combined inputs from the left and right eyes, from which our mind “chooses” what we actually experience, selects certain things from the two inputs and organizes them into a unified visual experience. With a bit of effort it is possible to see what the mind normally forces us to ignore, such as the peripheral, to which we are unaccustomed to paying attention. My artworks capture these “hidden” visual realities. 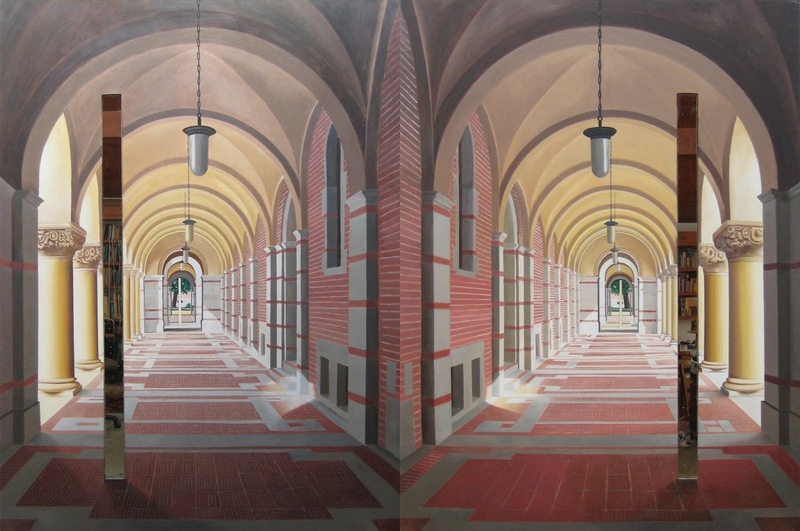 They suggest that the “linear perspective” window-like portion of the visual field is artificially narrow and ill conceived, and that by paying careful attention, the larger visual world can be perceived. By 1979 I had progressed to depicting the surrounding “spherical” visual field on a flat image with six equidistant vanishing points. It was then I realized it is possible to create an image of everything that visually surrounds us, except of course, of my own head. But it required several more years for me to accept that the visual world is irreparably incomplete. VBA: Fernando, if the mind edits down to one visual experience two sets of optical input, does that mean it actually creates the reality we perceive? FC: Yes, reality gets constructed in the mind. The world that we know is the result of the input that comes from “out there” and the peculiar way that our sense organs and our minds grasp and organize this input. Think, for example, of color, let’s say yellow. Vincent van Gogh had the experience of yellow when looking at sunflowers. I ask you, where is this yellow? Surely not in the sunflower itself! A colorblind person would not see the same flower as yellow. If you see the flower at nighttime, under moonlight, it would look gray. Colors only exist in the minds of the sentient beings that have those experiences; out there are only wavelengths of radiation. The mind plays the same kind of role in our understanding of the world as it does with our experiences of color, sounds, etc. Just as we “see” the world only from the human sensory perspective, we can only “understand” the world with our conceptual categories, with our scientific theories. That’s why I say that reality is constituted by the mind and in this sense also exists only in the mind. I intend for my art to shift the viewer beyond the narrow experience of reality to an extra-ordinary experience. VBA: Not easily, I read some of your published works on the void in our visual field, and learned that the observer is in a paradoxical relationship to it. FC: This is remarkable. Any attempt to produce a complete depiction of the visual world fails because visual information comes to an end at a place beyond which nothing can be seen, the void or blind spot, which is “the place” occupied by the presence of the mind that experiences that world, by the observer who in principle is not part of her own visual world, but is certainly a necessary condition for its existence. The visual world is necessarily incomplete because it depends for its very existence on the presence of an observer who does not belong to it. In other words we are conscious observers firmly located inside the visual/spatial world that we experience, and also altogether outside of it. VBA: Is this some kind of new discovery? FC: Emmanuel Kant, Satre and others formulated theories on the relationship of the self to perceptual experience and Ludwig Wittgenstein held the view that the metaphysical subject is the limit of the visual world. What is novel about my analysis is it rests on pictorial illustration that used an all-encompassing system of visual representation. My mapping the entire structure of surrounding visual space identified the blind spot, showed the visual world to be incomplete and discontinuous, the self to be by necessity a localized absence, both present in and absent from the visual world. VBA: Quite amusing to see you sniff at convergent linear perspective. Your writings dismiss that faithful system of spatial representation as invalid. How insolent. FC: It is a limited way of organizing three-dimensional pictorial space on a flat surface, because it fails to take into account a wealth of fascinating visual phenomena that a careful observer finds in the surrounding visual reality. I altered the system to expand its representational capacity, so it allows an observer to represent her entire visual world using a six point non-Euclidian spherical perspective system. FC: They said my art teaches our eyes new ways of looking. VBA: It’s some distance from Montrose, and the wild bamboo was unexpected, but your home is splendidly designed with living space that flows into multiple studios. FC: I built it myself, with the help of a friend. VBA: Everything, plumbing and electrical? FC: I contracted out the septic tank. VBA: The painting Dinosaurs’ Tracks seems to signal an additional artistic concern. We see the Fernando figure with the missing head to suggest the discontinuity of the visual field, a curved horizon to indicate the curvature of the visual world that we fail to notice, and certainly allusions to dinosaurs speak of time, but you also appear to be contemplating our ultimately mysterious existence. FC: I place myself sitting on what probably was a muddy riverbed on which dinosaurs walked millions of years ago leaving a superb track of fossilized prints. Needless to say the painting is an invitation to compare us with the dinosaurs. But the comparison is at least on two levels, one obvious and the other not so. The obvious one is that we humans are also just an animal species, part of the evolutionary process and our life is as precarious as those of the dinosaurs. Cracks on the rocks, chasms, volcanic sediments, craters, etc., emphasize this. And all of these too signal the passage of time. The less obvious comparison and a problematic one is between the fossilized holes of the dinosaurs’ tracks and the “hole” that appears in the painting, in the place where my head is. VBA: In my opinion the painting expresses precisely what you call the “exquisite finitude and fragility” of life. Dead animals and dark planetary gasses make a similar statement in Laocoon, another piece with a “missing head” Fernando figure. You are referencing another void, the existential one, in that before birth and beyond death there is a blank, about which we know nothing. Now you get to answer my favorite question for philosophers, except those overly Thomistic. How do you feel about the fact that we will never know why we exist? FC: Yes, we do not know why we exist, have no idea where we come from or where we go after death, if anywhere. But the fact that we don’t know this doesn’t imply that we will never know. Perhaps we will. We don’t know that either. But I see here no reason for despair, life is, or at least it can be, fascinating and full of meaning. Fernando Casas (b. 1946) presents Co-Constitutions in Houston, Texas. The Perfection of Time opens at Gremillion & Co. Fine Art on Thursday January 30--opening reception 6-8 pm. The Limit of the Visual World opens at G Gallery on Saturday February 1--opening reception 6-9 pm. 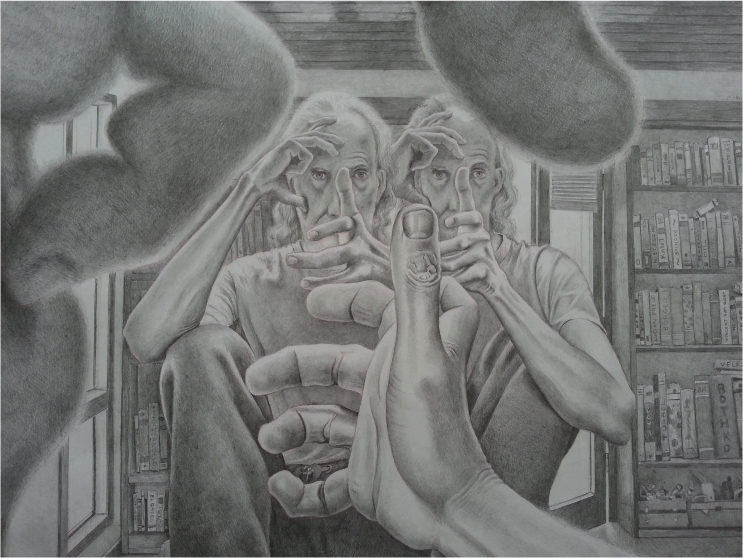 Duality opens at Redbud Gallery on Saturday February 1--opening reception 6-9 pm. All images Copyright B 2014 Fernando Casas – Artist, All rights reserved. Terrific, so interesting. I wonder if the studio process is part-in-parcel with the investigation. If, hyper-intellectual, could an assistant have done the work? Or is the act of painting the how or ethic? Report from the Golden Age of Art Comics: Kuš!